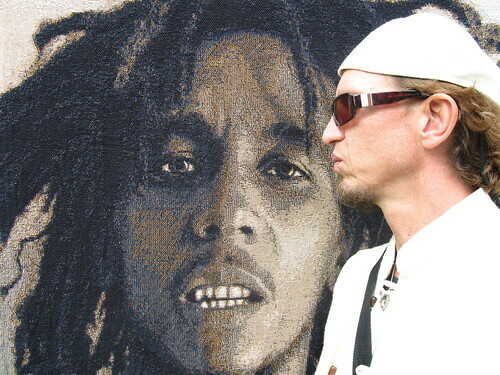 Matt Jensen, assistant piano professor and founder of the Bob Marley Ensemble, weighs in with his experience at the festival. 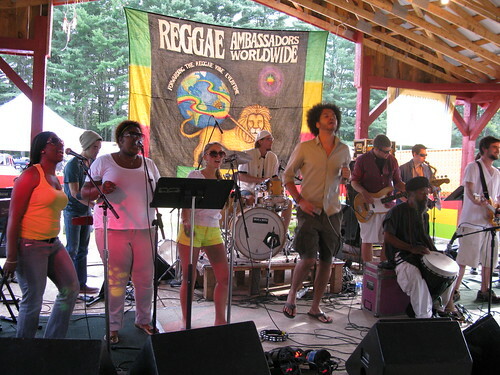 The Berklee Bob Marley ensemble performed on August 8 at the Charlemont Reggae Festival way out in beautiful Charlemont, Massachusetts. Ensemble leader Matt Jenson poses with his inspiration. This is the fifth year in a row that the ensemble has been invited to this small and spirited, longstanding reggae festival, run for some 15 years by the Rasta elder Ras Jahn. We thank him and his entire crew for giving the students in my Marley ensembles such a great performance experience! Students Andrew Steinway and Alison Rapetti were on board with us as videographers, so tune into mattjenson.com in a few weeks for video footage of the entire experience. On the bus to Charlemont. The day started with the 13-piece ensemble meeting at the Berklee “beach” at 150 Massachusetts Avenue, where a huge tour bus met us. We loaded up under perfectly sunny skies and hit the road for about 2.5 hours. The scene on the bus was pure tour vibrations with plenty of good music blasting on the bus sound system and lots of laughs, helping to bring the band members—some of whom had just met each other the night before in rehearsal—closer in friendship. 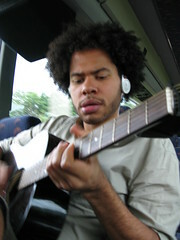 (I get the ensemble various professional gigs such as this one and the policy is that the previous semester’s ensemble gets whatever gigs come along, but many times not everyone is available for the gig so I will fill out the ensemble with past Marley class “graduates.”) A highlight of the bus ride was the vocal rehearsal that took place with Tubby Love on guitar, me on melodica, and our five singers rocking their parts! The festival takes place at the Charlemont community fairgrounds nestled in the foothills of the Berkshire Mountains, so as you can imagine, it’s quite beautiful. The vibe is pretty chill as festivalgoers spread out blankets everywhere, frisbee games happening, food and vendors everywhere. The stage is located under an open-air structure and the sound system is decidedly REGGAE, that is to say, with HUGE, I MEAN HUGE wattage dedicated to the low end. . . so powerful that the tin roof was shaking massively! The musical line up is of local New England acts including the Black Rebels, the Alchemystics, the Dis-n-Dat Band, Loose Caboose, and others. One thing about the Bob Marley Ensemble is that it is QUITE rare to see such a huge ensemble, complete with three horns, five singers, two keyboard players, two guitar players, bass, drums, and percussion, if for no other reason that it’s just about financially impossible to maintain such a huge group in the “real” world. So festivalgoers get a real treat to see and feel such a complete group. I get many, many, many compliments from audience members! True to our 5-year tradition I make sure that we get to the festival many hours ahead of our set so we can enjoy the other bands, eat some great food, toss a frisbee, and just enjoy the day. Piano prof Matt Jenson prepares to rise to the occasion. Our drummer from last semester was unable to make the gig so I took advantage of my recently ignited love affair with the drums (I bought a kit over winter break and have been practicing like crazy my reggae riddims!) and inserted myself as drummie! 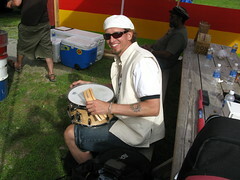 My first gig as a drummer ever! And by all accounts I stood up to the task well! From my vantage point on the drum riser it was a great scene: late afternoon sun pouring over us, all my fantastic students just completely rocking out all around me, and the jumping and rocking audience, nearly every one of them singing all the lyrics with us, directly in front of me. Nice! Our set went off just about flawlessly with a great vibe built up between the band and audience, real communication going on! We hung around for the Black Rebels set, feeling great about our set and just enjoying the scene before we loaded up and headed back to Boston. What a contrast in scenes; it’s like being on two different planets. From green grass, trees, moon, stars, and the reggae vibrations on a summer night to the concrete hustle of the city, II-V progressions, and the classroom. The memory of the Charlemont Reggae Festival will surely put a bounce back into all of our steps as we continue with life at Berklee! The Berklee Bob Marley Ensemble rocks the house.